The Canadian physician Henry Horatio Nelson was born six years after the Battle of Trafalgar, so it does not take much imagination to work out how his parents chose his middle name. Perhaps understandably, he chose to call himself Horace Nelson, a name less likely to cause his patients to smirk. Although little known today, Horace Nelson was a pioneer of general anaesthesia, and assisted at the first operation in Canada in which ether was used to put the patent to sleep. In an article published in the British American Medical and Physical Journal in 1847 he gave details of this and other investigations he had made using the new anaesthetic agent. First employed by Crawford Long in 1842, ether only came to widespread attention in September 1846 when William Morton, a surgeon in Boston, used it to remove a tumour from the neck of a young man called Edward Abbott. The image at the top of this post is a daguerreotype of a contemporary reconstruction of that operation, staged in order to make a visual record of the historic event. The dog was the chosen victim, and Jones administered the vapour. ‘Jones’ being the man who had sold them the ether apparatus. In the space of about four minutes, the animal was in a state of profound insensibility. I commenced my operations by cutting off a portion of one ear, which was followed by the removal of the whole organ, the dog, to all appearance, lying as if dead, no one confining him to the table. Next an incision was made from the hind leg, following the direction of the vertebral column, and continued as far as the middle of the neck, and with the greatest facility I removed the skin from that half of the body. The purpose of this drastic operation was to establish whether ether made the animal genuinely insensible of pain, or merely put it into a light sleep. I then proceeded to the amputation of one of the fore legs; but before completing the operation, was called to visit a patient. On my return, more than one half hour having elapsed, reaction had taken place, and I found the dog perfectly recovered, expressing by his deep groans, the severity of his sufferings. I’d like to think I might have stopped proceedings at this juncture, but Nelson was determined to carry on. In this state, I cut off one portion of the remaining ear, but the result was far different; his violent efforts and cries giving every one present to understand, that he was no more sleeping. To put an end to his sufferings, he was instantly strangled. Thank goodness for small mercies. But unfortunately Dr Nelson was not yet convinced; even worse lay ahead. A few days after, I instituted another series of experiments, when I carried my operations to a still greater extent, to prove conclusively, if full confidence could be placed on the effects of the inhalation. The dog was once more the subject. In three minutes and a half, he was under the full influence of the ether. The skin being removed from the whole of the body, I passed over the quivering flesh a poker heated to whiteness. That’s right: he really did flay a dog alive and then burn it with a white-hot poker. Several deep incisions were made in the muscles of the back, the right leg was entirely separated from the body, excepting the vessels and nerves, and I once more applied the poker to staunch the bleeding of several small arteries; not a moan was heard, not the least starting of a nerve was perceptible; the flesh smoked and the iron hissed. A grisly business; but Dr Nelson was only just getting started. 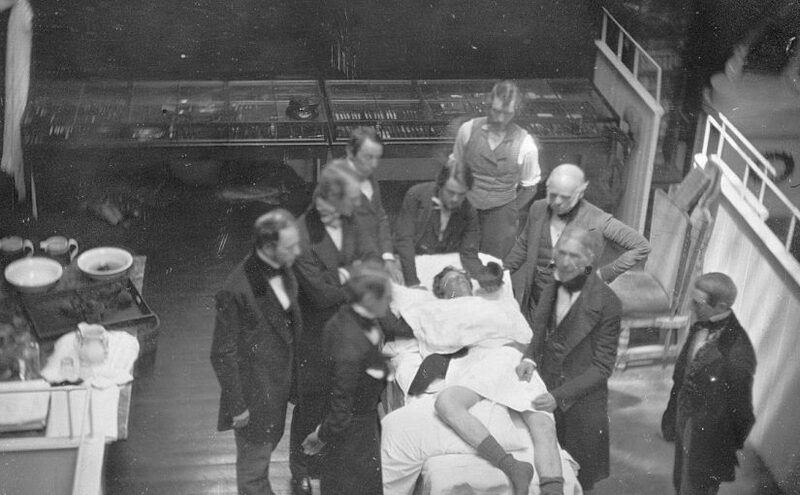 By means of a crucial incision, I laid open the abdominal cavity, and took out upon the table the mass of intestines; my students had then the advantage of a demonstration of the peristaltic motion of those organs, and could observe the rising and falling of the diaphragm, assisting most powerfully the respiratory act. The intestines were cut through in different places, the liver and spleen torn and wounded, every step followed by the application of the heated poker. Finally, the thorax was laid open, several of the ribs forcibly fractured, and the intercostal muscles lacerated. The time occupied in performing this long and severe series of experiments, was nearly three quarters of an hour, during which the breathing tube was applied to the dog’s mouth once every eight or ten minutes, on an average. By the aid of a little ice-cold water poured down his throat, in a few moments he perfectly recovered, turned on his side, and endeavoured to lick his numerous wounds, and tried to rise, but was so much exhausted by the profuse loss of blood, that he fell back on the table. The poor animal’s sufferings can barely be imagined. When the gentlemen present were perfectly satisfied with the happy results of these cruel and lengthy experiments, the dog was strangled. I was now fully convinced of the deadening properties of ether on the animal, and it was but reasonable to conclude, that its action would manifest itself in the same manner on the human subject. Some might argue that he went much too far in establishing this fact. Some weeks since, I had the pleasure of seeing my conclusions verified, on the occasion of the extirpation of a large growth from the upper part of the thigh. I assisted my father, Dr. Wolfred Nelson, in removing a tumour of two pounds weight, from a weak and debilitated woman. The ether was administered by Mr. Webster. In four minutes insensibility supervened; the tumour was quickly removed; the wound allowed to be exposed to the action of the air, to discover whether there might he bleeding from small arterial trunks; the ligatures, plasters, and bandages were applied; the patient meanwhile having no consciousness of our proceedings. This operation at least appears to have been a success, and the patient’s suffering relatively minor. During the last stages of applying the dressings, reaction slowly manifested itself; she seemed most happy, judging from her loud peals of laughter, but they were soon succeeded by sighs and tears, calling frequently for one of her daughters living in the country. The wound healed by the first intention, and in the course of one week, she was enabled to attend to her usual avocations. Contemporary newspaper reports allow us to put a date to this procedure, which took place on Saturday 20th February, 1847. And there you have it: the first operation performed in Canada with general anaesthesia. More information on Horace Nelson and his pioneering use of ether anaesthesia can be found in this 2014 article from the Canadian Journal of Anesthesia.